Take a deep breath. 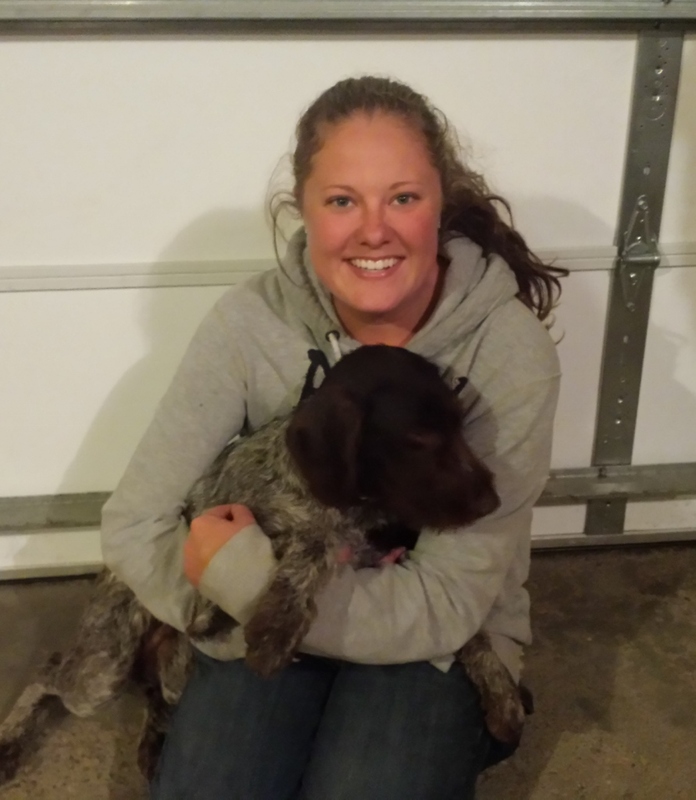 What you do next can have a significant impact on your success in bringing your dog home. Here’s how to get your search off on the right foot. First, download our action plan. As you’ll see, we’ve prioritized the recommended steps in a timeline to help you stay focused and on plan. Use this as your blueprint for your managing your search. Before you make any flyers or signs, consider the benefits of using a Google Voice number instead of your own. Google Voice is a free service that gives you a phone number that you can forward to up to six alternate phones. You can set it up so that your caller ID will show your Google Voice number when someone calls, letting you know it’s someone calling about your lost dog. It will ring all your alternate phones simultaneously. If you’re not available to answer the phone, one of your helpers can. Plus, if you miss a call, you can go on your Google Voice account and see the number in the call history, so you can call it back. It’s an unfortunate reality that prank and scam calls are common with lost dog searches. With Google Voice, you can block their number or send anonymous calls directly to voicemail, so at least you don’t have to talk to them. 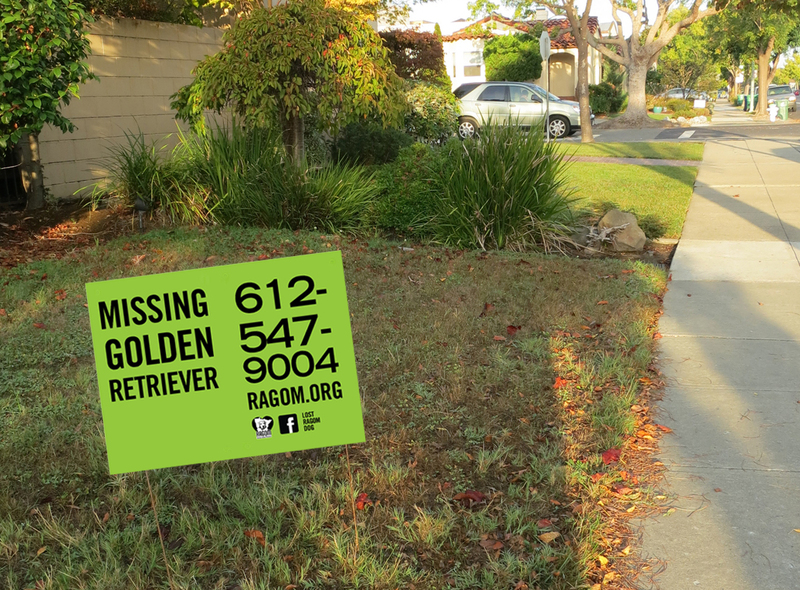 The first sign you deploy should go in your front yard (or at the point where your dog went missing). Because if someone caught your dog right away, they may be walking around looking for his owner. Use anything—a cardboard box, piece of plywood, even an old sheet—and write or paint in big letters, “DID YOU FIND MY DOG?” and your phone number. 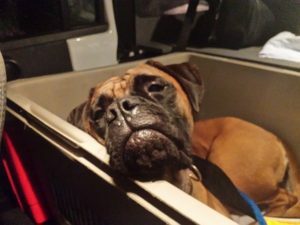 Facebook is a great help in lost dog cases, as it allows you to not only spread the word about your missing dog, but also to build a network of supportive friends and strangers. Many people will volunteer to help with flyering and other awareness efforts, so be sure to take advantage of this free resource. Generally, we recommend creating a Facebook Group (not a Page or Event) as a “home base” for public communications. You’ll want to introduce yourself as the owner of the lost dog and invite people to share the Group with their friends. Do not share exact sighting locations. And never publicly reveal the location of a trap or feeding station. Waiting: Don’t wait for your dog to return on his own. If you have lost sight of your dog, don’t spend much time driving around looking for him. Instead, get going on the steps in our Action Plan. Chasing: Lost dogs should never be chased. For shy and skittish dogs, the act of chasing him places him in the role of prey, with you as the predator. The experience will cause him to be even more fearful of humans, making him that much more difficult to catch. Even if the dog is friendly and playful, chasing him becomes a game—one that you can’t win because dogs are so much faster than humans. And whatever you do, don’t even think about chasing down a lost dog with an ATV. 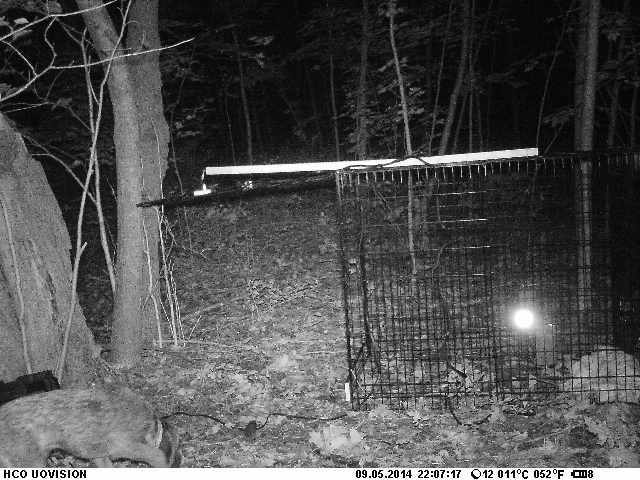 Trapping: We don’t recommend commercially available traps, especially if you have never used one. 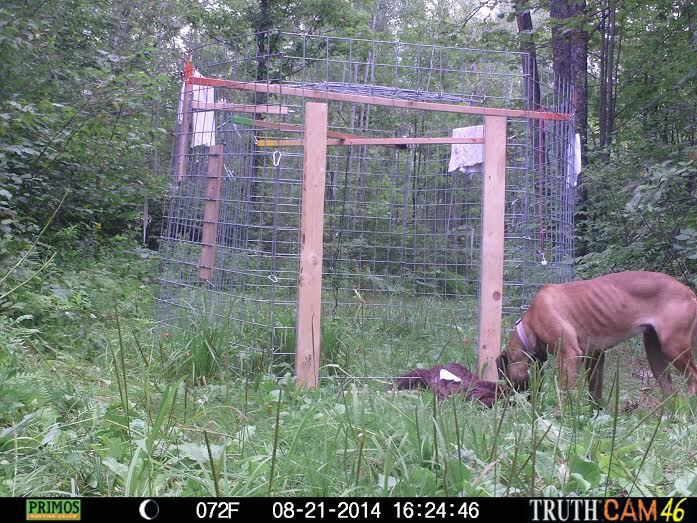 If your dog has a bad experience in a trap, it makes trapping him much more difficult in the future. 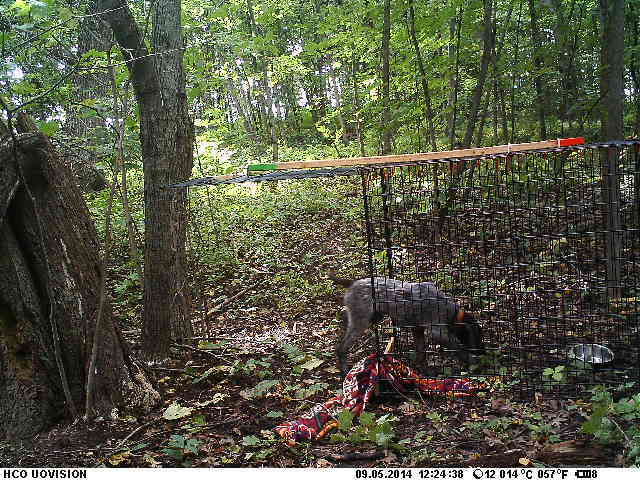 If your dog is returning to a specific place, that’s a great situation for trapping, but call us first. 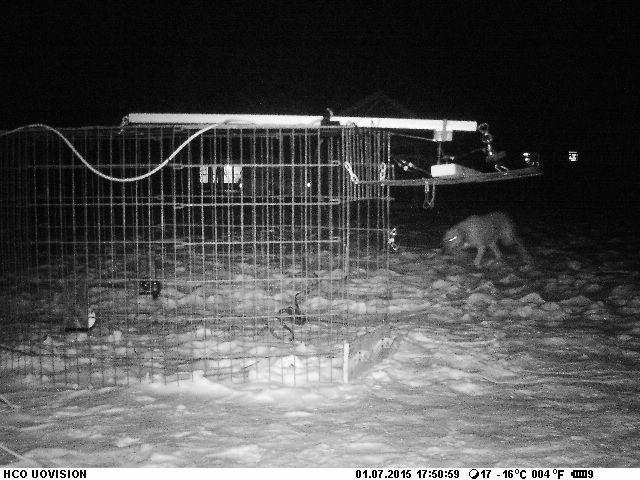 If you’re in our service area, we can bring one of our traps. If not, we have instructions for how to build an effective one of your own or we can suggest other ways you can contain your dog. Grabbing: If you see your dog, it may be tempting to grab him if he’s within reach, but if he is anxious or scared, chances are high that he will bite. And you’ve just scared the crap out of him. You’ve confirmed his perception of all humans (even his owner!) as dangerous and to be avoided. If you do manage to catch him, he will be traumatized by the experience and may now have a bite history. Don’t grab. Rather, earn his trust slowly and patiently by offering food. 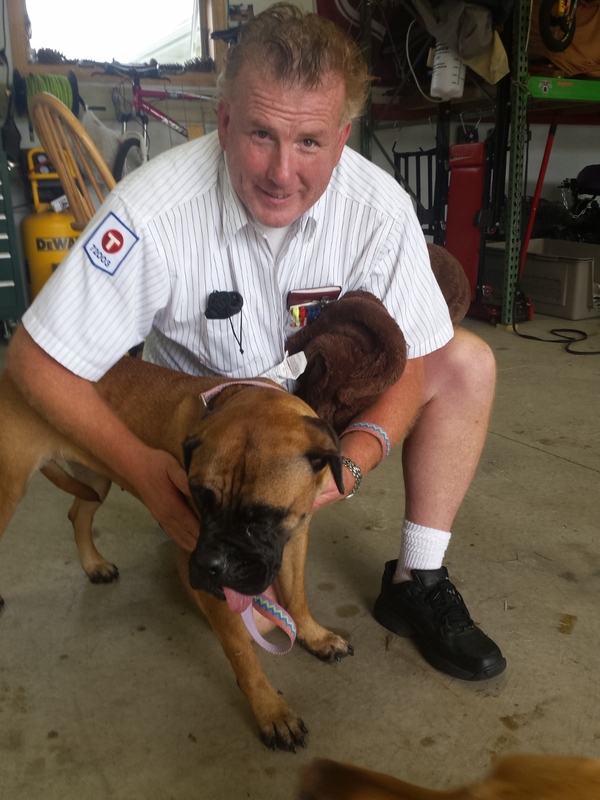 Eldad Hagar of Hope For Paws is a master at hand-catching dogs. Watch his many videos to learn his technique. Netting: We don’t recommend throwing a net or blanket over a dog. You could miss, traumatizing the dog, or he could get injured trying to escape the net. Net guns (which propel the net at the dog at high speeds) should be avoided altogether. 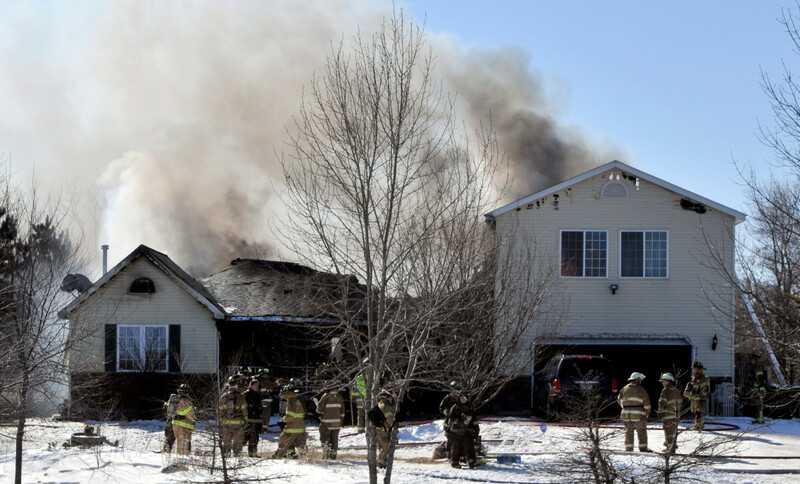 On March 7, 2015, a family in Big Lake, MN suffered a devastating fire. When the blaze broke out, the only adult at home was in the basement shower. When she got out, she heard her two dogs barking, also in the basement, and neighbors pounding on the windows. She and the dogs came upstairs, but Charlie and Bella were too scared by the flames to exit, and they bolted downstairs again. The owner tried to get to them, but could no longer see through the smoke. 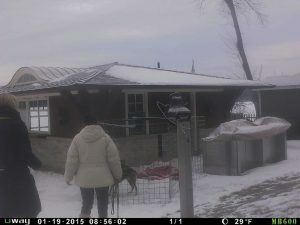 Neighbors broke through the basement windows and attempted to save the dogs, but they couldn’t find them. 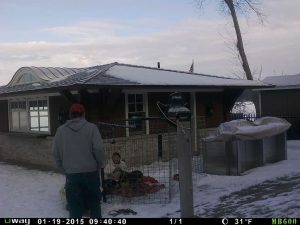 For two agonizing hours, the family watched their home burn with their dogs inside. 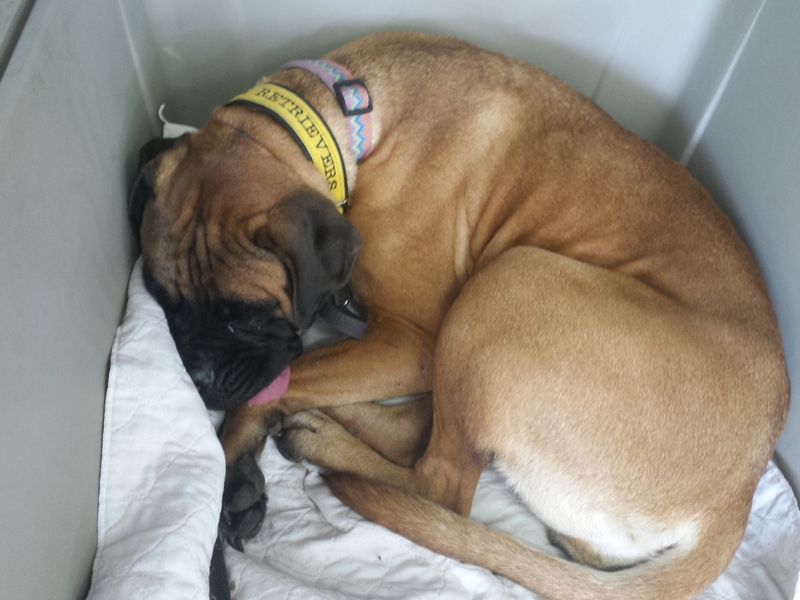 Once the fire was out, though, firefighters found the dogs huddled in the basement tub. They had suffered smoke inhalation but were alive and unburned. 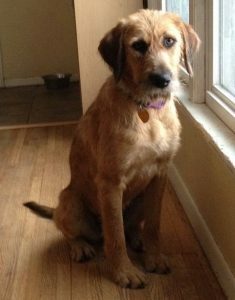 Unfortunately, when the dogs were brought outside, Charlie—a 10-month-old Golden Retriever mix—panicked and ran off. It was a nightmare within a nightmare. Firemen and neighbors tracked him through the snow to the nearby Mississippi River, but never actually saw him. 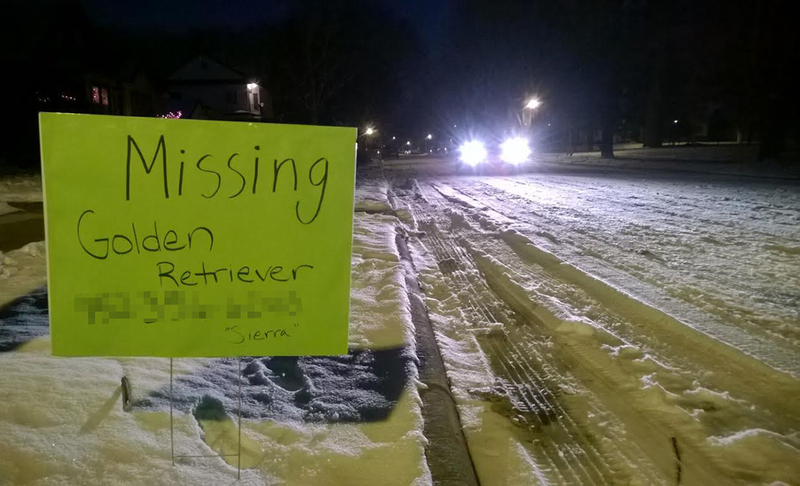 Meanwhile, friends put Charlie on Lost Dogs – MN. That night and through the next day, about 40 people in the neighborhood were out looking for him. 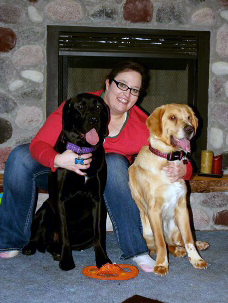 With Labrador mix, Bella, Charlie’s bonded companion. 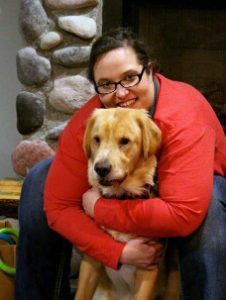 A family friend told the owner about the Retrievers, and we received a call at about 5 p.m. on Sunday. On hotline duty that day, I learned that Charlie was running up and down the wooded shoreline of the river and nobody could catch him. They would see him and call out or offer treats, but he ran from them every time. I advised Tasha, the owner, to ask everyone to leave the area except for her. She should wait by the river with her other dog, Bella, and sit quietly until Charlie appeared. The wind was blowing along the river that afternoon, and I hoped that it would carry Tasha and Bella’s familiar scents to Charlie. I also hoped that clearing the woods of all strangers would help him be less anxious and stop running. Tasha waited about two hours. As it was getting dark, she received a call. Turns out Charlie had wandered out of the woods and over to a residential area. where he allowed a couple of teenagers and kids to put a leash on him. (He loves kids!) Minutes later, Tasha and Charlie were reunited. Including Charlie, it would seem. Without all those strangers pursuing him in the woods, he was able to come out of his panicked state and stop reacting so reflexively. Though the family lost their home, all four of their pets (Charlie, Bella and two cats) survived. I’m very grateful that the Retrievers were able to play a small part in that success. On Monday, January 12, Trixie went missing from her parents’ house near Lake Minnetonka. 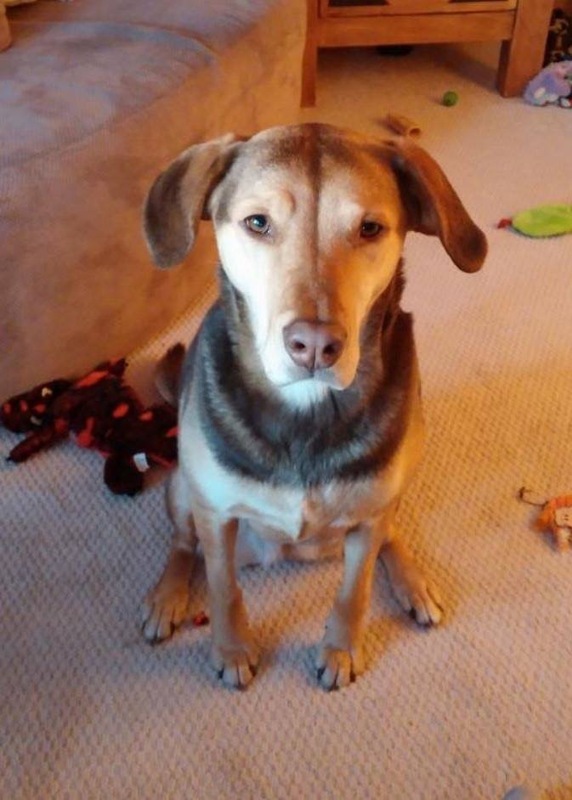 Her parents immediately placed lost dog notices on Lost Dogs MN and Craigslist. That Wednesday, the Retrievers were engaged and I was assigned as case manager to bring Trixie home. Immediately, we activated our social media network including our Facebook page to alert followers of Trixie’s plight. 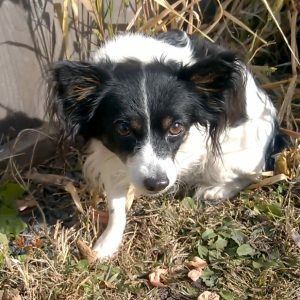 Trixie’s parents quickly posted Trixie’s lost dog flyers throughout the neighborhood and surrounding area with her picture and contact information. Those first few days, Trixie traveled from her house across the frozen lake at least a mile and was seen by her Good Samaritan, Amy. Trixie visited Amy’s house twice a day for two days straight. Concerned about Trixie’s well being, Amy was kind enough to leave out food and even left a food trail to attract Trixie to the garage. Amy’s house had become Trixie’s safe area. Over the next few days, sightings of Trixie were reported to us. 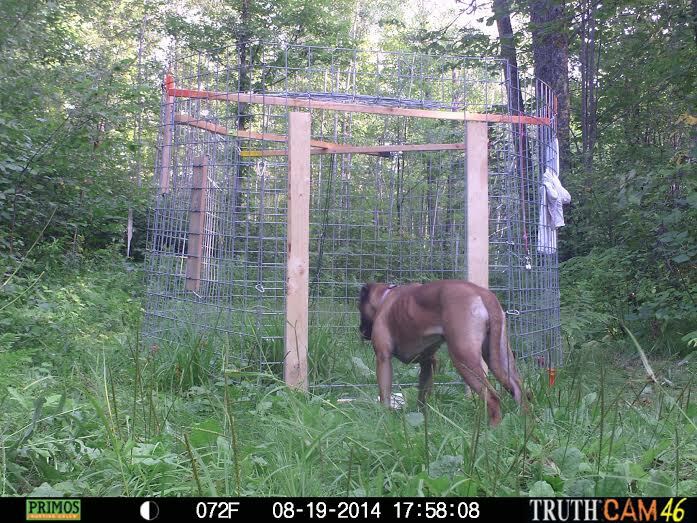 On Thursday, I set up our Missy Trap equipped with a magnetic door closure controlled by an electromagnetic light beam and a separate trail camera to alert us if Trixie roamed near the trap. 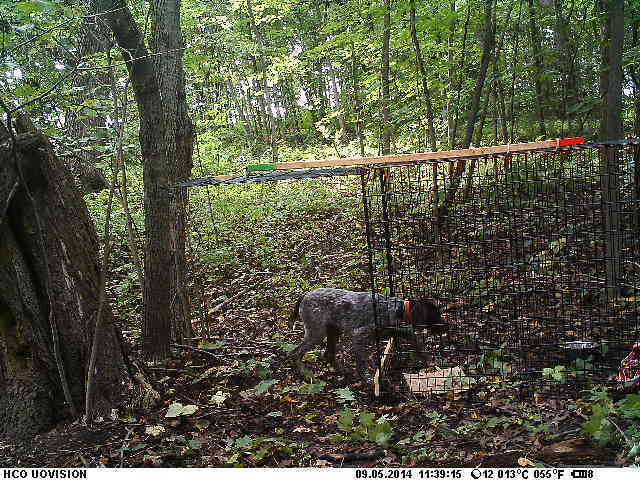 Scent trails were left in four separate directions, all leading to the trap and camera. Inside the trap was a bowl full of enticing food and Trixie’s favorite blanket from home. Unfortunately, Trixie failed to visit the site that evening but was spotted by others in the neighborhood. Sightings continued on Friday and her parents visited each of the sighting locations but couldn’t find her. 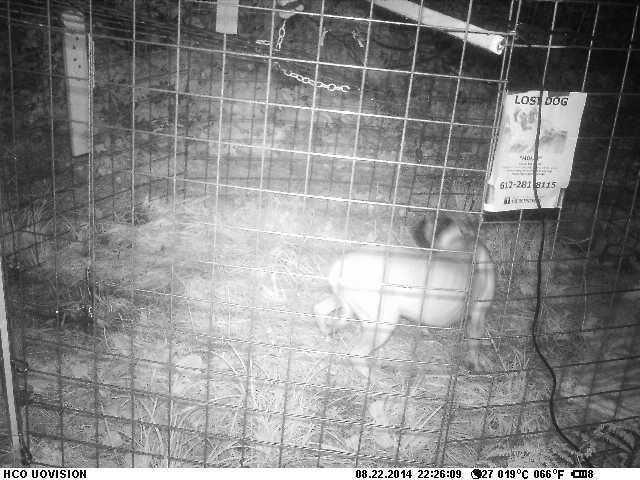 We had her pup sister Lucy walk around Trixie’s safe area and trap in hopes that she would recognize her scent. 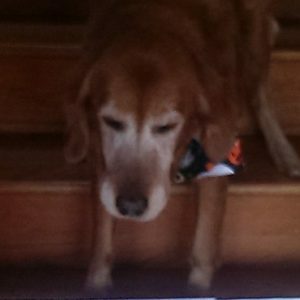 On Saturday, I received a call saying Trixie was seen on a local walking trail. Trixie’s parents joined me at the trail but found nothing until Trixie’s dad spotted her at the top of a hill near the trail. He left the car, walked slowly toward Trixie, only to see her bolt the other way. As is common with lost dogs, Trixie was clearly in survival mode and cautious of everything and everyone, even her own parents. Trixie was spotted again the next day on a nearby lake but was chased by concerned searchers into a wooded park reserve. It confirms what we know well: never chase a lost dog. Simply sit down, wait and call the owner with the sighting information. For Trixie, there were no further sightings for several hours and I thought we were back to square one. Hope returned early on Monday morning when Trixie was seen sitting on her Good Samaritan Amy’s front porch, howling loudly as if to say she was ready to go home. Amy’s husband opened the front door and gently encouraged her to enter the house but without surprise she refused and trotted away. Amy immediately called me and I rushed to the house. When I arrived, I saw Trixie myself under some pine trees, she stood and looked at me, I sat down, didn’t say a word, I tried without success to lure Trixie with bacon treats. Again, she just trotted away. I let a short bit of time pass so Trixie wouldn’t be scared away from the area, then Amy and I decided to check the food inside the trap, only to find Trixie lying inside the open trap on her favorite blanket. 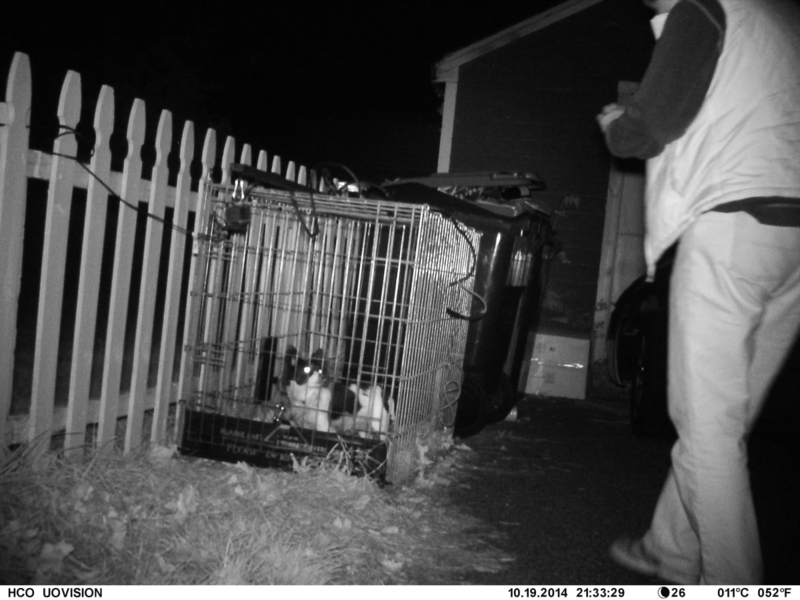 This posed a challenge – the trap is only set to close when under constant surveillance to protect the safety of a trapped dog and was locked open the previous night. Without the trap set, Trixie was safe in the trap but could also leave at any time. I decided that we had Trixie in her safe area and now was the time to try to get the trap set to close, which required me to drive her out of the trap…As I slowly approached gently shaking a bowl of smelly turkey sausage and quietly saying “It’s breakfast time, time to eat”, Trixie left the cage and hid near a boat house about 40 feet away, allowing me to quickly set the food by her blanket, set the trap, and return to the house to monitor. Not long thereafter, Trixie returned, smelled around the inside of the cage and tripped the electromagnetic beam, closing the trap’s door. At 8:56 a.m. that Monday morning, Trixie was finally captured. She appeared in good health and seemed frightened, relieved and exhausted all at the same time. I called Trixie’s parents with the good news. While we were waiting for Trixie’s parents, Amy and I sat with her; Trixie proceeded to give us both kisses as if to say “Thank you”. 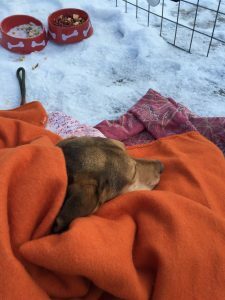 We wrapped her in warm blankets and talked to her letting her know she was now safe. 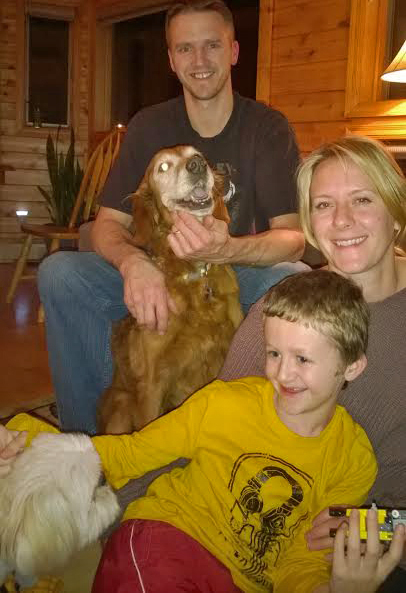 Trixie’s parents arrived a short time later, she was thrilled to see them, her tail was wagging the minute she saw them. Trixie’s dad told me later in the day that Trixie was so happy to see her pup sister Lucy that they were both jumping around kissing each other and Trixie also gave her kitty brother kisses. A very happy homecoming! I had the opportunity to see Trixie few days after her rescue, she was in good spirits and her dad said she was doing very well. The Retrievers would like to thank Trixie’s parents for all of their hard work searching, the many concerned spotters who called with sightings, the volunteers who distributed many flyers, searched and helped spread the word about Trixie and I would especially like to thank Amy and her husband Joe for the vital role they played in bringing Trixie home safe. 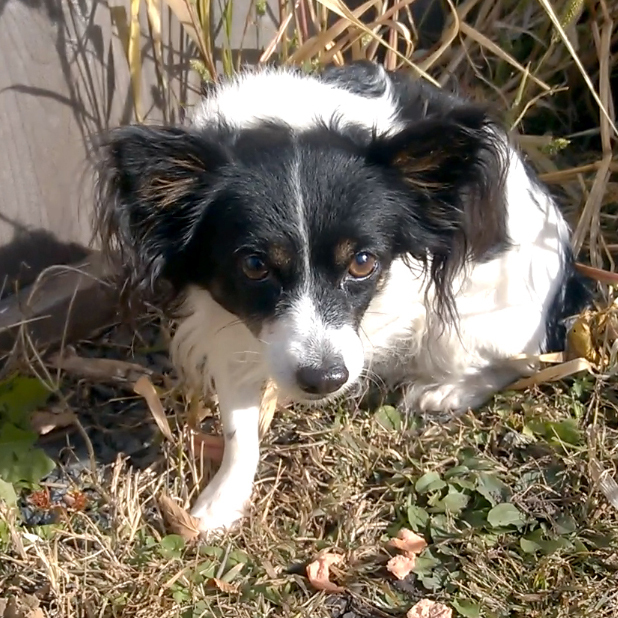 This pint-sized parti-pup was loose in South Minneapolis for several weeks. 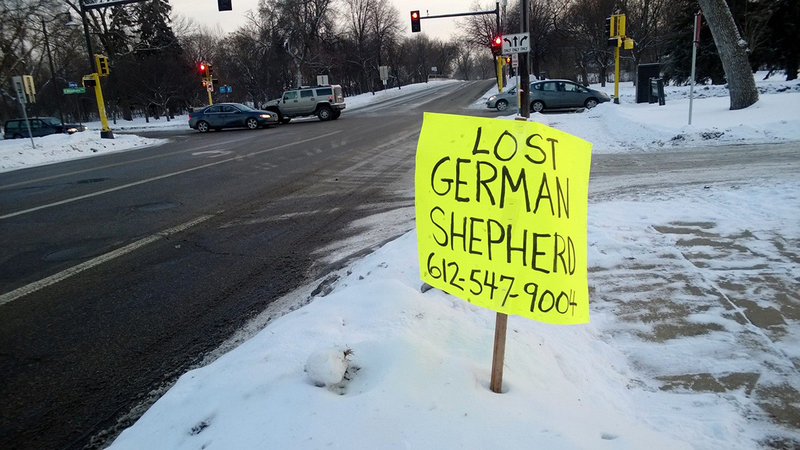 After scanning Craigslist ads, notices on NextDoor.com and posts on Lost Dogs – MN, a Good Samaritan named Sandra counted 16 different reports of a stray black-and-white dog roaming between Minnehaha Parkway and the Keewaydin neighborhood. 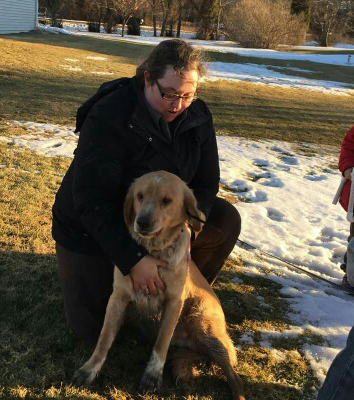 Concerned for his safety, she contacted the Retrievers and began flyering and listing the sightings online. 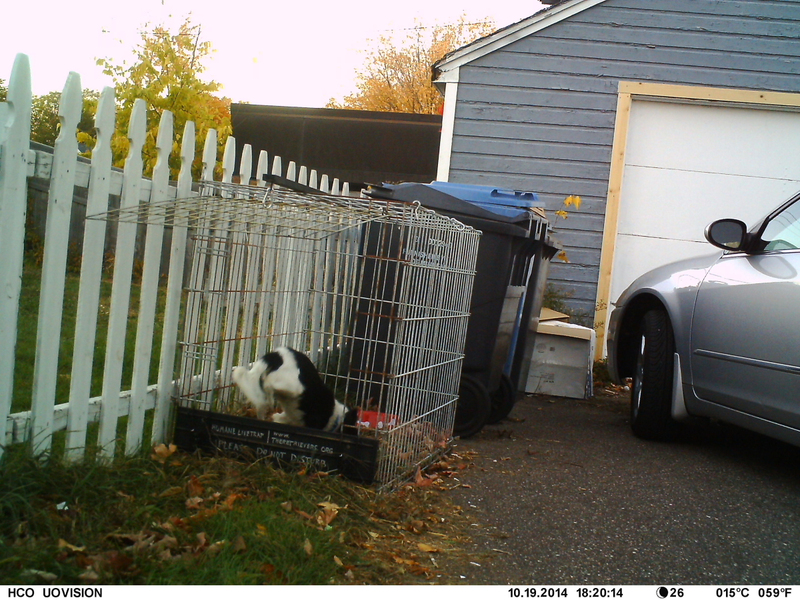 Sandra received a report that the dog had been sleeping next to a resident’s garage, so we monitored the area for a couple of days, but “Little Man” failed to show. Then we heard from another resident further south, who said that the dog liked to hang out in her backyard with her yellow lab, Frank. As luck would have it, Little Man was there when Sandra and I went to follow up on the tip. 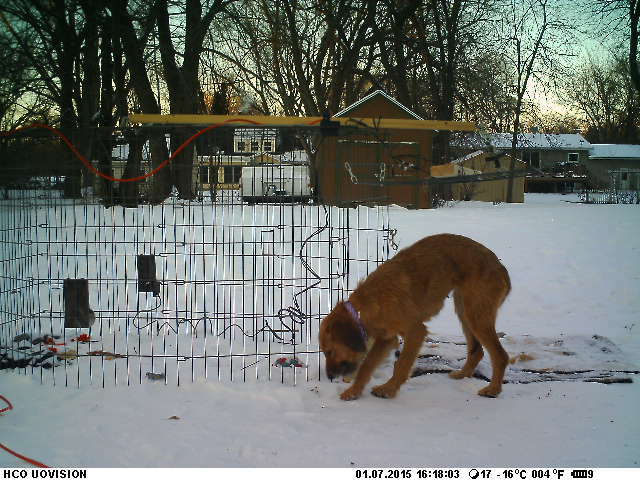 I tried to get a slip lead on him, but unfortunately, he was able to squeeze through a hole in the fence that the homeowner didn’t realize was there. Not to worry. The scrappy little dog returned a short while after we left. 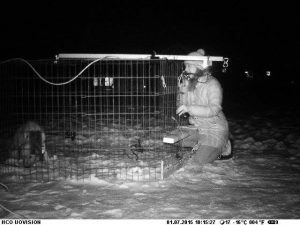 We set up a Sammy trap that evening, baited it with bacon and chicken, and locked it open. 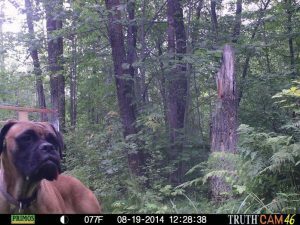 After confirming through trailcam photos that Little Man was not afraid to enter it, we armed it to trigger with our sensor beam/magnet system. Little Man was captured that evening. Sandra was eventually able to locate Little Man’s owner. Sadly, they did not want him back. But Little Man got a storybook ending anyway. He was adopted by the people whose yard he had been visiting, and now he gets to kick back with his buddy Frank every day. 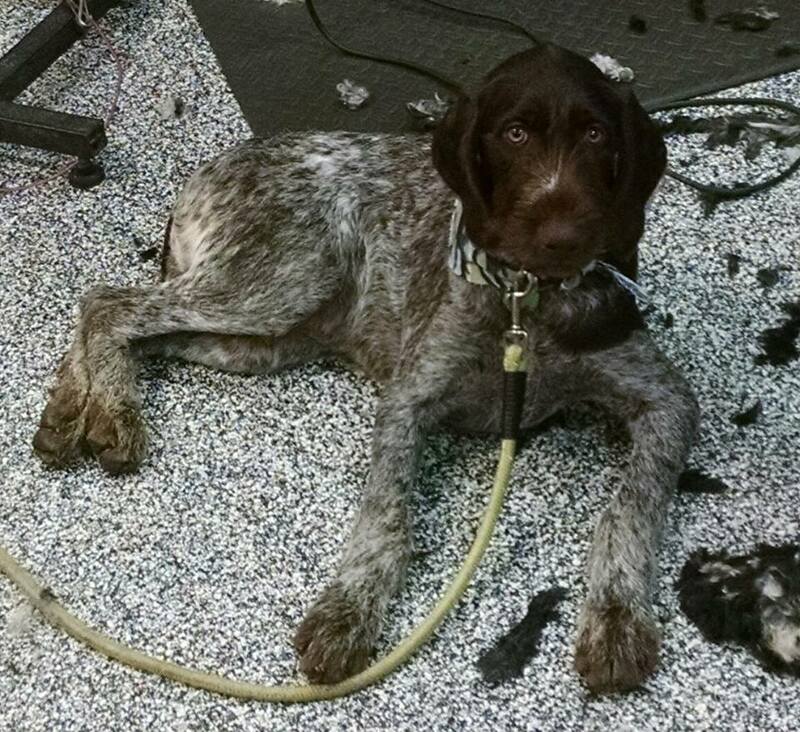 The Retrievers were recommended to, and contacted by, the owners of a 4 month old German Wirehair Pointer named Tater Tot. Tater Tot had darted from their home after only a few days being there. The family had done a great job of flyering their neighborhood and getting the awareness out there that he was missing and they were getting calls with sightings. It appeared Tater Tot was staying safe in a wooded park area not too far from home. 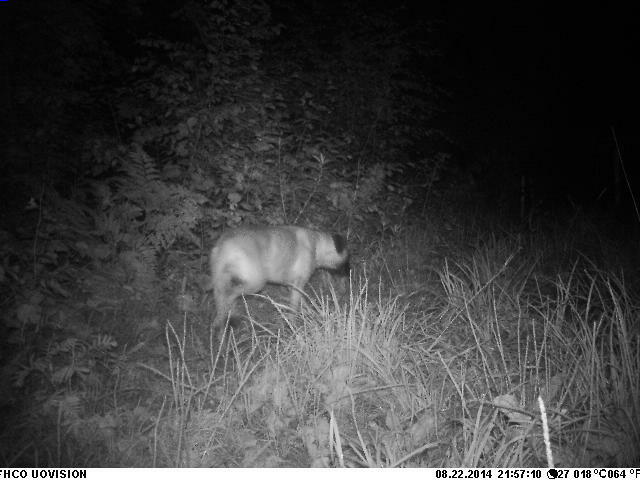 But if he saw anyone he would run away, which is pretty common for a skittish dog that is in survival mode. As is common, Tater Tot even ran away a couple times when his dad saw him and called to him. 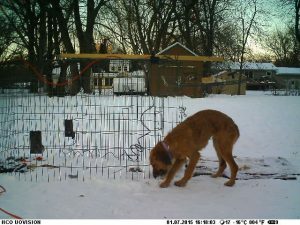 Being that he was staying in the same area and considering his size we decided to use our Cash Trap to capture Tater Tot. 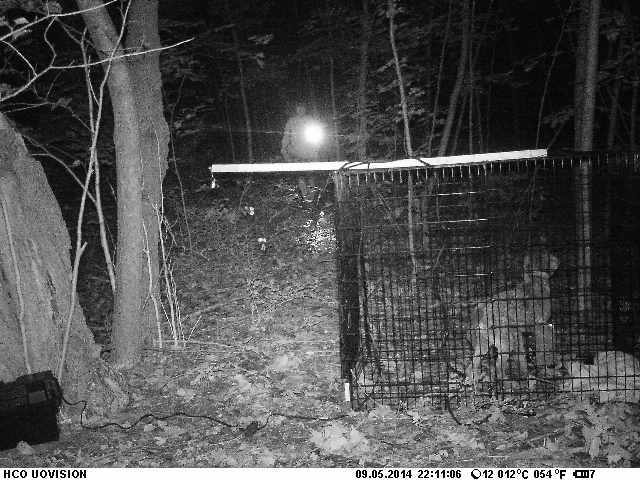 The trap was set up in the wooded area where his family had been leaving food and water, and for the first 24 hours we locked the gate open to allow him to get used to going into it for food and not having any hesitancy to do so. 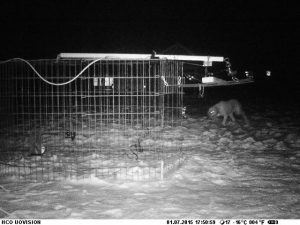 His family kept the food stocked and we observed him several times in and near the trap on our Cellular Trail Camera. 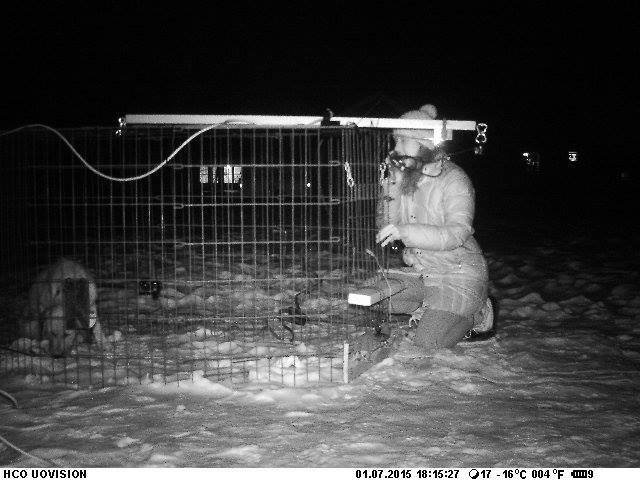 We now knew he was happy to enter for some food so it was time to arm the trap with the sensor and magnet for capture. Because of the remote location, our deep cycle marine battery was set up near the trap and used to power the sensor and magnet for the gate. Once the trap was armed it was a matter of waiting for him to return. I sat in my jeep about 150 yards away and could not see the trap through the forest. We would rely on pictures sent from the camera to tell us he had returned. It was well after dark that the email we were all waiting for came in. Tater Tot was approaching the trap. 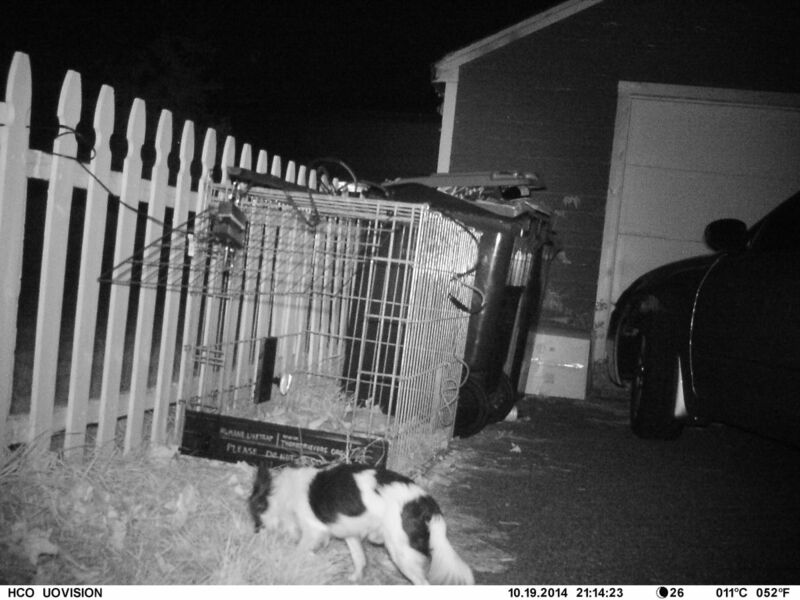 As I got out of my jeep to get ready once we had a picture of him in the trap, I heard the noise of the gate closing and Tater Tot soon started barking out of fear of what just happened. We had him. I ran to the trap and the poor little guy was shaking from the cool evening temps and the unknown of what was happening. 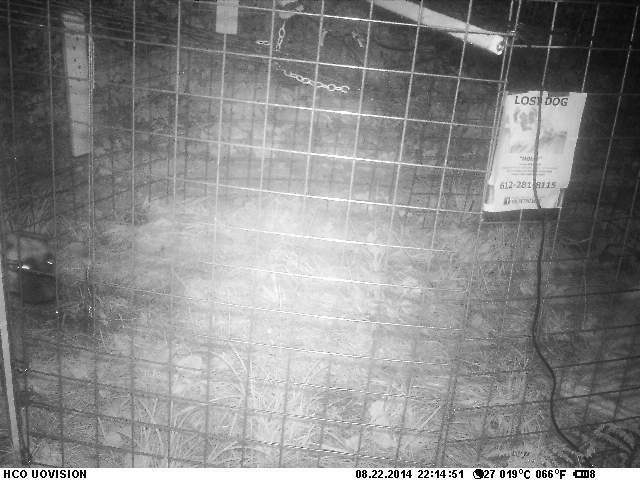 His owners soon arrived at the trap along with Curt, a kind neighbor who kept me company and allowed me to park in his driveway, during the 6 hours of waiting. I entered the trap after a few minutes of letting Tater Tot calm down and realize 2 of the 4 people there were his mom and dad. 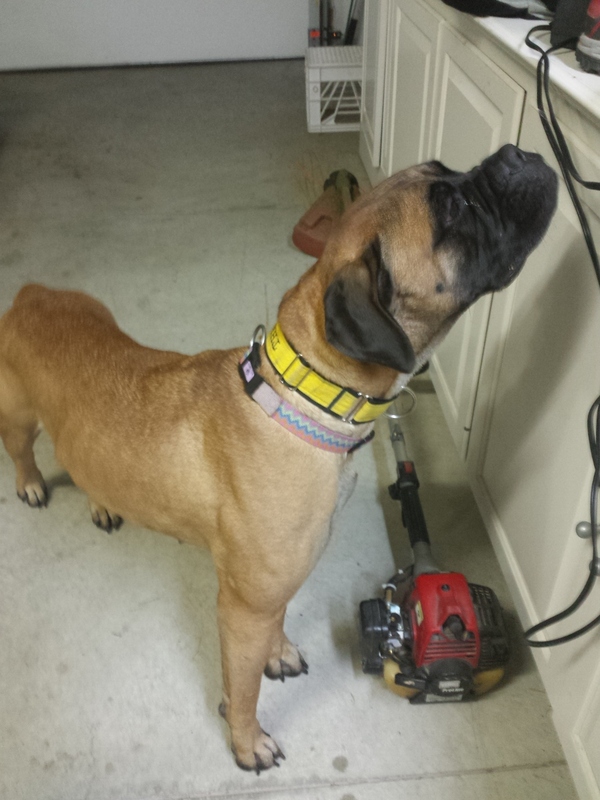 I put a Martingale collar and a leash on him and we got him out to get home to safety. His family took him right away. 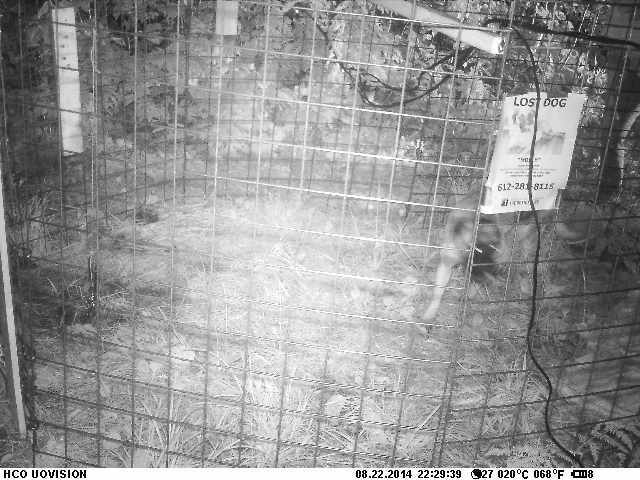 After Curt and I took down the trap, I stopped by to visit Tater Tot and he seemed to have no injuries and was doing well. His family did a fantastic job of helping him get home by getting the awareness out there right away so more people were watching for him. 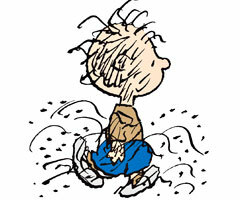 Without that, the search for Tater Tot would have been much longer that the 5 days he was on the run.